Steffen Cuneo takes off after finishing shooting. Cuneo would win this year’s Spring Biathlon men’s pro race. On a warm, sunny day at Auburn Ski Club, a pair of local athletes put a stamp on what has already been a successful season of Nordic racing at the club. 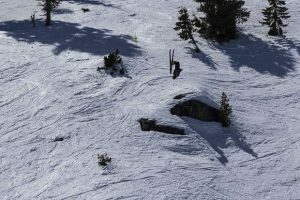 Truckee’s Steffen Cuneo, who competes for the club, put together an impressive showing on his skis to overcome a tough outing with the rifle to win the men’s pro division; while on the women’s side, no racer could catch Sugar Bowl Academy’s Lexi Madigan, who finished more than five minutes ahead of second place. Last Sunday’s race at Auburn Ski Club marked the final biathlon event of the year in the area, and brought in more than 70 competitors for youth, novice and pro racing. 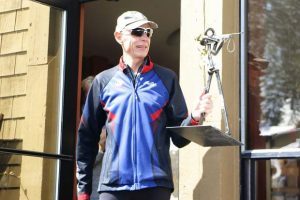 The event also marked the final biathlon before the retirement of Auburn Ski Club’s Biathlon Director and Head Coach Glenn Jobe. In honor of Jobe, who has spent years teaching at the club and was an Olympic athlete in biathlon, the club placed signs marked with some of the coach’s favorite sayings, such as, “Ski like a long tail cat in a room full of rockin’ chairs,” all over Sunday’s race course. In the men’s pro division 12-kilometer race, Cuneo, 17, didn’t have his best day with the rifle, but was more than three minutes faster on skis than any other racer to take first place. Cuneo finished the race with an adjusted time of 45 minutes, 1.8 seconds. Etienne Bordes, 16, crossed the finish line in second with an adjusted time of 46:53.6. Another local, Nikolas Burkhart, 17, was third with an adjusted time of 5:28.3. 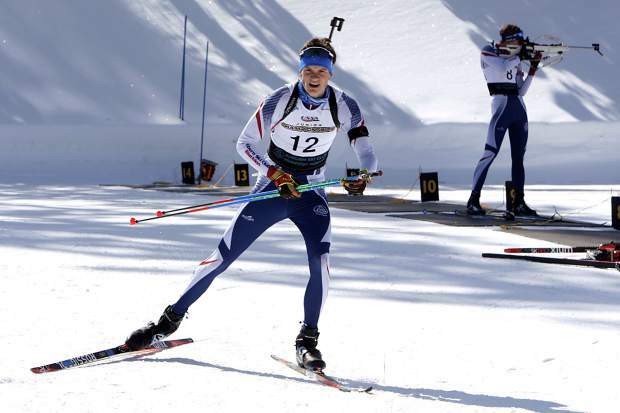 In the women’s 10-kilometer race, Madigan, 17, outpaced the field of 13 athletes on the skis by more than three minutes and tied for the second best performance on the range to take first place with an adjusted time of 46:14.8. 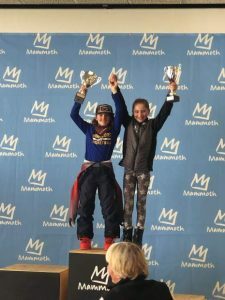 Local skier Zoe Klenke, 17 was second with an adjusted time of 50:50.8, followed by Janelle Webb, 31, in third place with an adjusted time of 51:38.1. In the 4.5-kilometer novice race, Gus Johnson raced to the overall win with an adjusted time of 18:25.1. Sadie Tucker, 14, won the women’s race with an adjusted time of 20:46.3. The day’s events also included a youth race. Ryden Burke, 9, took first place in the boys’ 3-kilometer distance with an adjusted time of 16:09.2. Chloe Mitchell won the girls’ race with an adjusted time of 17:35.4.